There are applications where a standard steel kit spiral staircase or welded spiral stair would be appropriate. However, some custom spiral stair designs are such that some might not even attempt. Some applications demand a special dynamic look [as in this photo]. This is a one of a kind steel and mahogany beauty. This spiral stair spans from a fifth floor to a roof deck 16' above - delivered and installed in one section! Stairways, Inc. fabricated a lifting cage with tracks to roll the stair onto the fifth floor and then spin it through a double door. Freestanding, this stair serves as art to the owner and all guests. 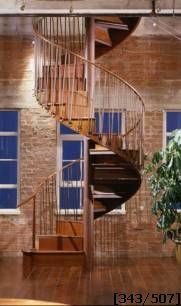 If your application calls for a custom spiral stair, bring your ideas to Stairways Inc. Let us work together to make your idea become a reality.